Sunday I (well, mostly Cherub) gathered some locally-grown pumpkins and squashes at a nearby u-pick farm. Since nearly everyone has a gourd or two lying around this time of year, I thought I’d give you some ideas about how you might use them. One minute they’re seasonal decorations on your front porch and the next you’re serving them to party guests. Result! 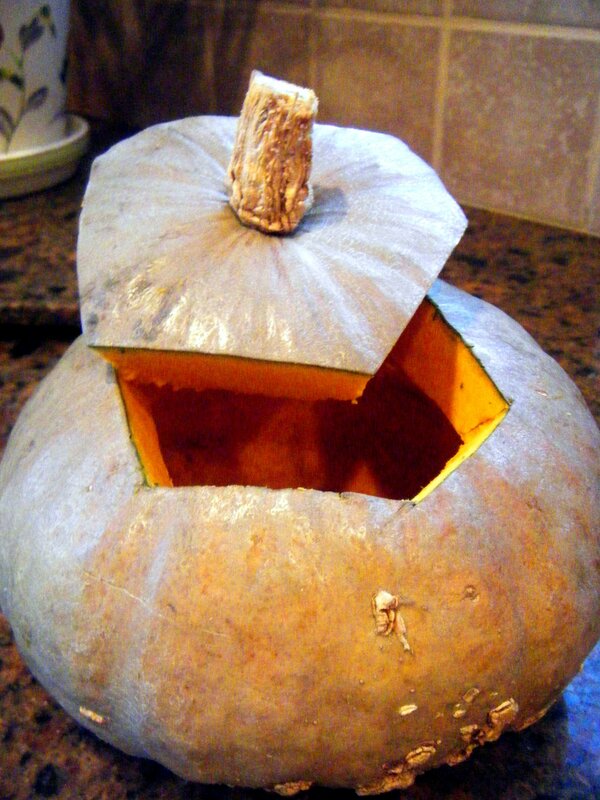 Today, I used one of those squashes, the demure Carnival, for a posh little party snack. Tonight’s do was hosted by my friend Elpis, and as I’m sure you’re aware, party season is upon us. These nibbles are easy and sure to please, so add this recipe to your arsenal. 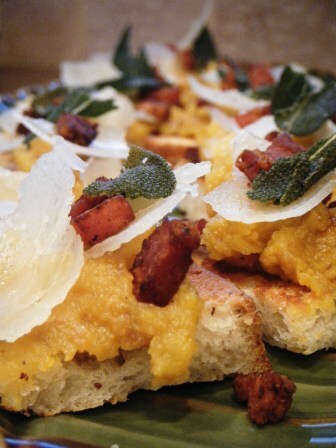 The basics are roasted squash, pancetta, parmesan and buttery toast. You can go two ways with this one: quick and dirty or overacheiver. I opted for the overacheiver version for your viewing pleasure, and to encourage you to do the same. Because we had a lovely filling lunch at Skillet, I couldn’t exactly bring myself to make a full on dinner. Which was fine by everyone. So for a quick, satisfying meal, I made the old fall standby, butternut squash soup. 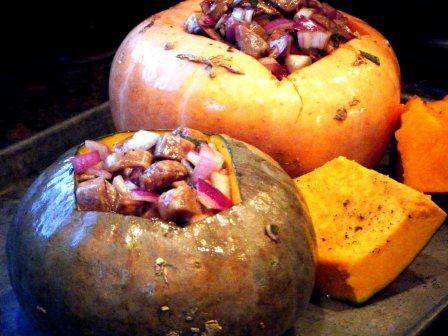 It doesn’t have to be filled to the brim with cream, it can be rich and silky with just the squash and some good stock. Garnish with bacon or don’t; it’s flexible for vegetarians and meat eaters alike. Begin by peeling your butternut squash. PK tip: peel it twice. If you do it once, it will still be somewhat pale and starchy looking. You want to peel to the nice orange part. Cut the ends off, cut it in half, remove the seeds and cut into 1 to 2 inch cubes. Space cubes evenly on a roasting pan with a drizzle of olive oil and some salt and pepper, mix with clean hands to coat evenly. Slide into a 400˚ oven for about 30 minutes. While the squash is roasting, in a large sauce pot render some bacon (if using). When crispy, remove to a paper towel and save about a tablespoon of the fat to soften the onion and garlic over low heat. When the squash is soft (a fork pierces it easily) either add to the pot with the softened onion and garlic along with 3 cups (to start) of stock and use an immersion blender to puree. If you don’t have one, combine all in a food processor or a blender. Return the puree to a sauce pan to heat through, adding more stock to thin to the consistency you like. For a garnish, whip the cream until it’s stiff (but not butter!) and add in the sage and a pinch of salt. Another – even quicker – method is to use a small food processor or an immersion blender with a whisk attachment. Super fast whipped cream. I like that. 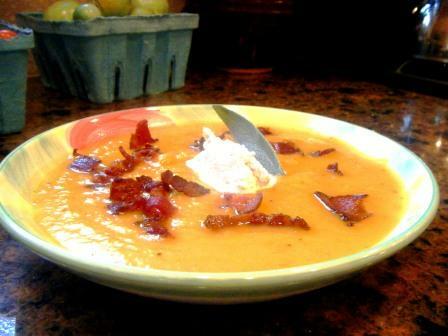 To serve, ladle the soup into warmed bowls, garnish with a generous sprinkling of bacon and a nice spoonful or a quenelle (if you can do that – I still kind of stink at making them) of whipped cream. Serve immediately as the whipped cream begins to melt quickly. The only ingredients that weren’t local were the olive oil, salt and pepper. For complete sourcing, see the Farms and Producers page. Playlist included Carry Me Ohio, by Sun Kil Moon. Sounds like falling leaves. Poseidon is somewhat of a world traveler. After spending some time in Slovenia, he brought back with him a delightful way to incorporate turkey into a weekly menu. He first came across this dish at the restaurant Julija on Ljublijana’s Main Square. It’s a very typical and traditional Slovene dish, but with Italian notes (after all, Venice is just a stone’s throw). Turkey and game are more popular there than chicken. 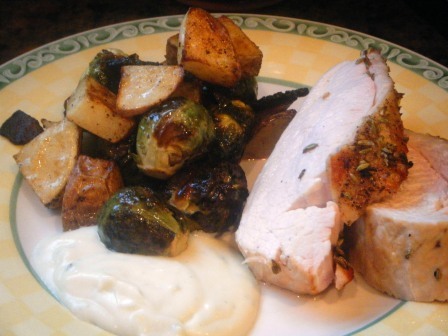 Why not consider a turkey breast for your weeknight meal? It’s not a lot of work (season the ingredients and toss them in the oven, make a quick sauce), but it’s a lot of flavor. 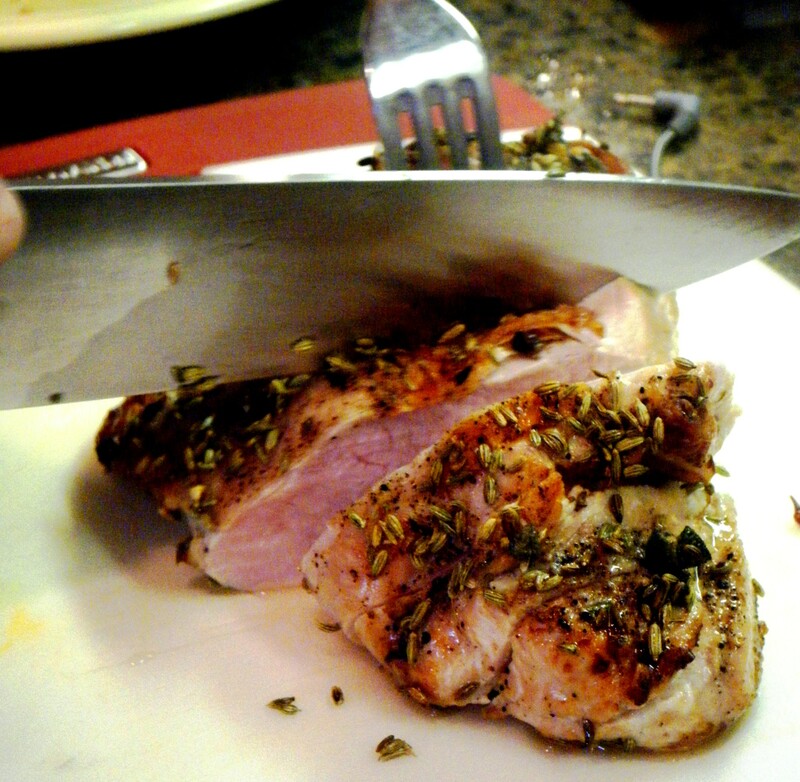 Combine the fennel, garlic and sage then stuff under the loosened skin on the turkey breast. Drizzle breast with olive oil and season with salt and pepper. Place in a roasting pan and put in a 400˚ oven for approximately 50 minutes, or until an instant-read thermometer reads 165˚. 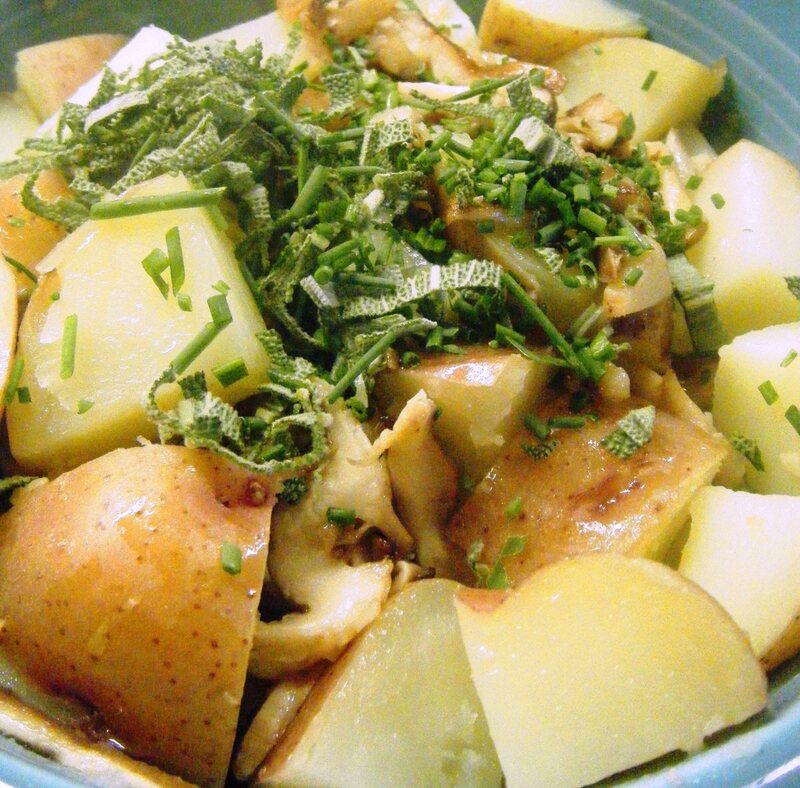 In a bowl, combine the Brussels and potatoes and season with salt and pepper. Arrange on an oiled baking sheet, place in a 400˚ oven (along with the turkey) for approximately 30 minutes, or until vegetables are browned. Shake the pan once or twice during roasting to evenly brown. To finish the vegetables, cook the bacon in a large pan over low heat until crisp. 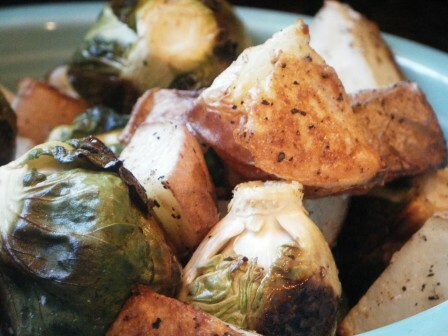 Add in the roasted brussels and potatoes, along with a splash of apple cider vinegar. Stir to incorporate, cook over low heat for a minute or two. Serve with Hedges C.M.S. 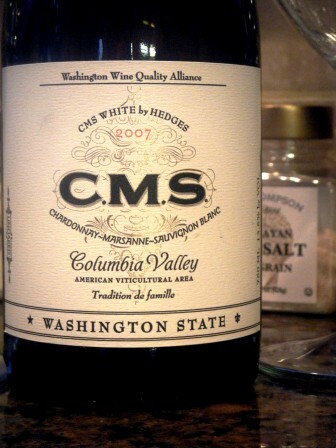 White, from Washington State. It is a shockingly good pairing. PK tip: be careful, if you have leftover bread in your pantry, you may be tempted to eat the rest of the Gorgonzola sauce out of the pan as you’re cleaning up. Well, that’s not really a tip. It’s something to do. And come to think of it, I recommend it. Tonight we listened to Hang with Me, by Robyn, amongst other things. It was Beethoven who said that “when the ideas are good, the elaboration is not of such great importance.” I think this attitude is equally important in the kitchen. Take last night’s dinner, for example steak and potatoes. The idea for the potatoes originated from the Kitchen of Light: New Scandinavian Cookbook by Andreas Viestad. The original recipe called for dill. My neighbors with gardens and I will tell you sadly that the dill this year was terrible. So what to do? Being the first of September, the sage was growing gloriously, waving at me through the kitchen window, begging to be picked. And tucked close by were some ridiculously long chives. Add in a couple of cloves of garlic, some mushrooms and it was a beautiful dinner on the table in 20 minutes. Whenever you are approaching a recipe, think about it like a musician thinks about a musical score. Or a method actor thinks about building a character. Ground your decisions in your experience. When you taste something fantastic, think about why it tastes fantastic. What’s in it that’s makes it taste good? The more often you do this, the more comfortable you’ll become in the kitchen, cooking with a recipe or (gasp!) cooking without. Cube and rinse the potatoes, cover them with water and a copious amount of salt and boil for 8 to 10 minutes, or just until tender. While the potatoes are cooking, melt the butter in a small sauté pan, and add the mushrooms and a bit of salt. Just before the potatoes are done, add in the garlic to the mushrooms. When the potatoes are tender, drain and mix in the mushrooms, the chopped herbs, drizzle with olive oil and taste for seasoning. Add additional salt and/or a few dashes of Tabasco (or pepper, if you weren’t out like we were). 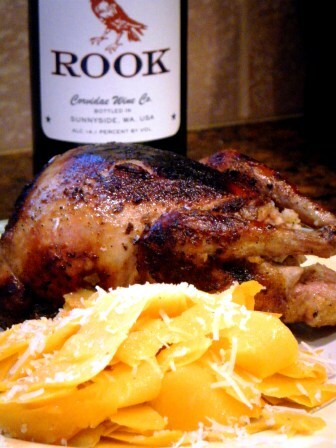 This serves nicely with a piece of flank steak that has marinated in olive oil and then been grilled. Heat up a grill pan when the potatoes go in, sear the meat well (4 to 6 minutes per side) then let it rest while you assemble the potatoes.